The latest issue (#36) of Wargames, Soldiers & Strategy magazine has just been released, and it’s a nice one for Vietnam War fans as it’s main focus is on the 1968 Tet Offensive. Part of the Dossier feature is a look at what figures are available to game Vietnam in various scales. It covers 28mm, but not in as much depth as my own Beginners Guide to Gaming Vietnam in 28mm. However, the glaring ommission to my mind is for 20mm gamers. 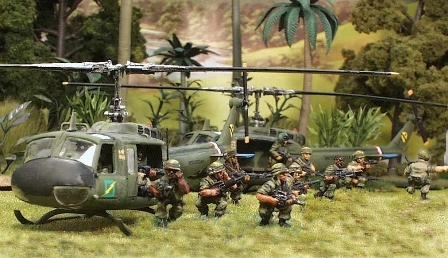 The author obviously majors in either 28mm, 15mm or 6mm, and essentially ignores 20mm except for mentioning plastic kits – and so completely fails to mention the excellent Vietnam range produced by Britannia Miniatures, which provides everything that you need to game the war in 20mm.